Next Wednesday, December 5th, will see the first official Deluxe Orbitdyne product launch! Packaging and everything! A sneak preview is above, and there will be more as I approach the release date, stay tuned! Not quite Battle-Beasts! For fun I painted up a spare Takara-Tomy Beast Fight Saga Lion and clear "burst" Dolphin. The Lion is a complete repaint, he was originally red, brown, and green. I didn't do much to the dolphin, just a pearl coat, and ultra-gloss finish. Usually, Monster Kolor gloss produces a terrific glassy look on clear or translucent plastic, but that didn't happen here, live and learn. The weapons were painted silver with clear colors on top. Makes them almost look vacuum-metalized, it's one of my favorite techniques. I should have listened to Philip Reed's warning. Reading his review of Elegab Shuttlegon got me interested in the wild Kaiju designs of Naritada"Nari"Shintani. 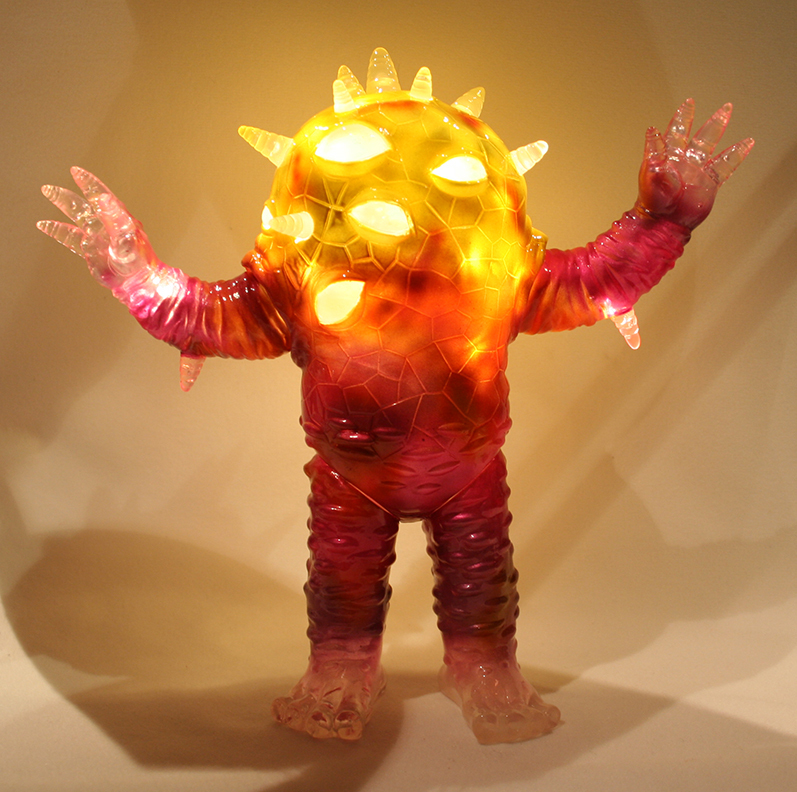 Under the name Elegab, he is a one-man sofubi powerhouse: designing, sculpting, casting, and painting his own figures (or so I'm told). Nari's designs are grotesque yet charming, full of playfulness and character. They wouldn't look out of place in the wilder Tokusatsu shows. Nari often sells unpainted blank versions of his toys, and I knew I had to try painting one. The first that I've finished is Daburunga (AKA 'Bad Friend). I haven't read any background on the design (Nari has some fiction for his monsters in a book, and on his website), but the design seems clear enough: A robot fused with a monster. I imagine some kind of teleporter accident, and now they're The Odd Couple 1999. I was able to purchase one from Nari, cast in glow-in-the-dark vinyl, my favorite! That made the painting decisions easier, as I knew the glow had to show through the paint, at least partially. Monster Kolor C-Thru are fantastic for this sort of treatment. 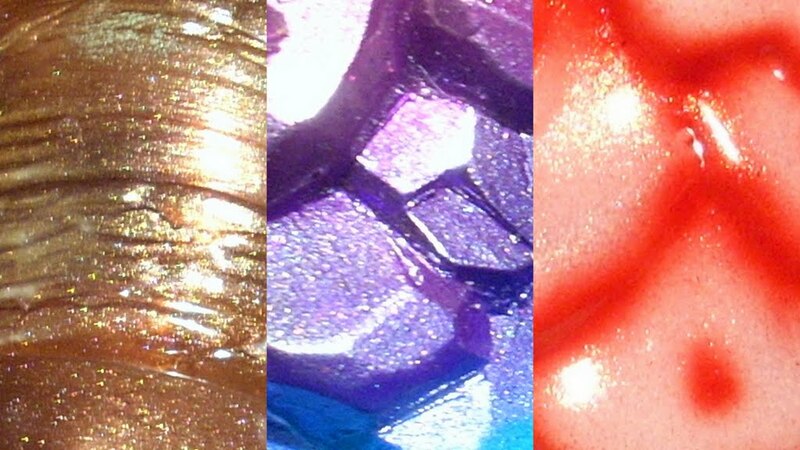 Very fine translucent paints, perfect for adding vibrant color without obscuring the material underneath. I decided to use them on the monster side, and do opaque colors on the robot side. ...and stopped dead, as I now had to figure out how I wanted to paint the robot half. My problem was, I liked the monster half so much, I really didn't want to mess up on the robot side. It took me months to work up a plan of action. I masked off the monster side and proceeded with a thick coat of Monster Kolor Green Tea metallic (my favorite green in their catalog), and a highlight of Money Shredder Pearl. Money Shredder is a complex pearl with flakes of green, red, and gold metallic. It's tough to capture the pearl effect in pictures, but it adds a strong sense of depth to any paintjob. For the details, I deviated from my usual process, and removed the robot arm and leg and painted them separately. The joints were masked and received a thick coat of standard Monster Kolor Red, and a highlight of lighter Crosshair Red. Unfortunately when I reattached the limbs, the paint scraped clean off, in some very visible places. I ended up removing the masking, and repainting the joints freehand with both brush and airbrush. I think there's one really clean line, and the rest are fuzzy. Live and learn! I also masked off the fingers, antennae, eyes and various bumps. Then painted them with the same red mix as the joints, and used standard MK Yellow and MK Eyezon Yellow for the eyes and what I've decided are lamps on the body. I was unsatisfied with the masking, I haven't gotten a good masking technique at all. So I went back freehand with the airbrush again, especially on the eyes. There's some unsightly overspray on the head which I'm not to happy with, but I can't remove it without removing the paint underneath. I'll just consider it added character. For more depth, I gave the yellow parts a touch of C-Thru Orange. The last color added was a thick coat of MK Moon Dust paint on the mouth. It's a silver pearl with a very fine metal flake, and I like how it highlighted the grill, without covering the green completely. To clean up the antenna and fingers, I went back with Monster Kolor Brushable, until I had clean lines. Finally, I put on one more gloss coat, and the figure was finished! I toyed with the idea of doing one side matte, and the other gloss, to up the contrast, but the matte finish took vibrancy out of the paint, so I settled on an all-gloss finish. Eyezon 5th show at Double Punch - Thank You! Edit: The remaining customs are on sale now! Get 'em while they last! More pictures from the show over at the Max Toy Co Blog, and Toy Karma. Thank you again to Mark, Double Punch, and to the buyers! There are still a few customs left unsold, be sure to watch the Double Punch store for sale details!